Footprints in the Sand is located right next to one of the 3 outdoor pools in Ocean Dunes and is across the street from the ocean with deeded beach access. Not only is this condo beautifully renovated and decorated, the location is also fantastic! 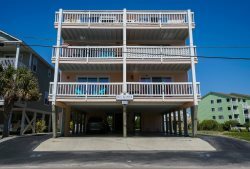 Footprints in the Sand offers 2 bedrooms, 2 full baths, beautiful furnishings, ceiling fans, stainless steel appliances, a private deck, a 2 car carport, a community indoor and 3 outdoor pools, club house, fitness center and so much more! The master bedroom has a queen bed and the second bedroom has full sized bunk beds with a trundle underneath. The private back deck overlooks beautiful trees. Also, this building has an elevator! This condo is centrally located to the aquarium, Fort Fisher museum, great shops and restaurants. No need come by our office and wait in line to pick up a key. This home is equipped with a key less entry lock so you can start enjoying your vacation the minute you get there. Essentials such as paper towels and toilet paper will be supplied to get your vacation started! Don't miss out on spending your next vacation here! This property does not allow pets of any kind. We are also a smoke free property.